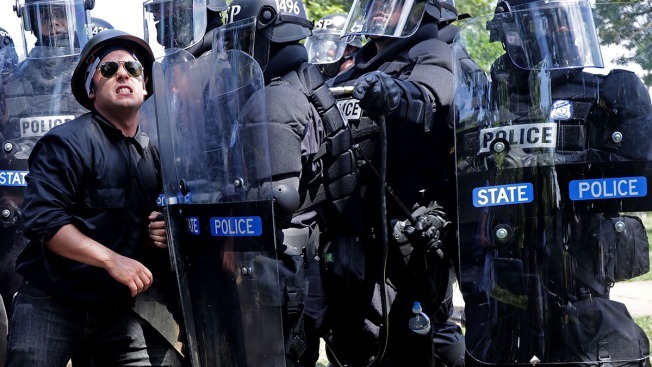 In this Aug. 12, 2017, file photo, white nationalists, neo-Nazis and members of the "alt-right" are forced out of Emancipation Park after the "Unite the Right" rally was declared an unlawful gathering in Charlottesville, Va.
Officials in Charlottesville, Virginia, declared a state of emergency ahead of the anniversary of the 2017 Unite the Right rally, where one woman was killed amid clashes between white nationalists and counterprotesters. Virginia Gov. Ralph Northam declared that the state of emergency would be in effect Aug. 10-12. In a press conference at city hall Wednesday, he said the state of emergency was declared for the potential impact of events planned during the Unite the Right rally in D.C. and in Charlottesville. "Declaring this state of emergency in advance of the anniversary and the related planned events will help us ensure that the state and the city have all available resources to support emergency responders in case they're needed," Northam said. Though there are no permits issued for another Unite the Right rally in Charlottesville, many residents are concerned that white supremacists could still come without an official permit, News4 reported. Community events including prayer sessions and free counseling are planned for the weekend. 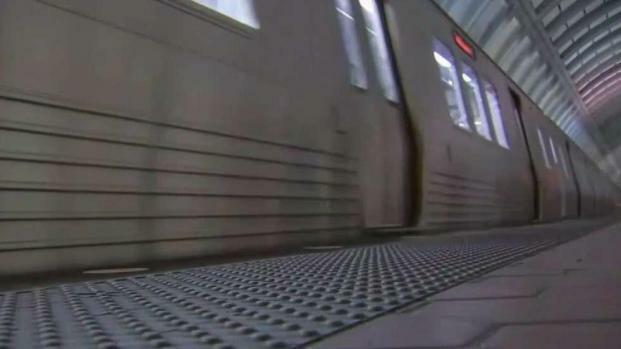 Metro's board chair is backtracking from an idea to use special trains for demonstrators participating in a white supremacist rally. The proposal sparked immediate backlash. News4's Darcy Spencer reports. But officials are stepping up law enforcement efforts to ensure that any gatherings remain peaceful. The state of emergency would streamline state and local operations this weekend while also allocating $2 million in state funds. The declaration authorizes the Virginia National Guard to assist in security efforts. Many roads will be closed around the Downtown Mall area and Market Street Park until Aug. 13, government officials said. Charlottesville’s website has a list of updated bus routes and more information on road closures. Two security checkpoints will be set up downtown and officials plan to search the public for a number of prohibited items, including glass bottles, metal containers, BB guns, stun guns and other weapons. Anyone found carrying prohibited items could be subject to criminal charges. Law enforcement will also be enforcing a ban on wearing masks or hoods that conceal the face. Loaded firearms are prohibited on public property. The city refused to issue a permit for another Unite the Right rally in Charlottesville after 32-year-old Heather Heyer was killed when a car slammed into a group of counterprotesters at last year's event. Two state troopers sent to monitor the rally were also killed in a helicopter crash. Local activists are still pushing for the city to acknowledge its historical and current ties to racism and police brutality among other issues. 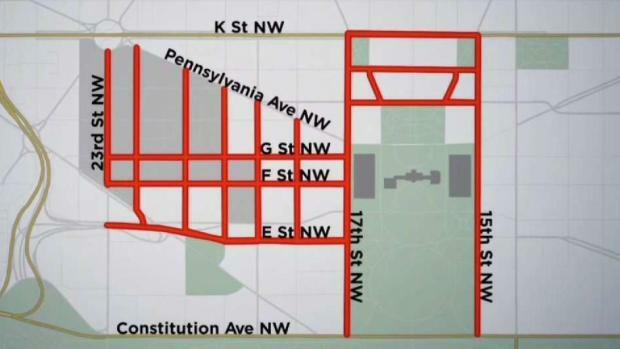 Police announced the road closures they are planning for Sunday's white supremacist rally in the shadow of the White House. Darcy Spencer reports. "I just would like people to focus on the anniversary, not on Heather, but on the issues that she died for — Black Lives Matter, overpolicing, affordable housing, for more truth and the telling of the history of Charlottesville — and to focus on where they need to go as a community," Heyer’s mother, Susan Bro, said. Charlottesville denied an event permit requested by rally organizer Jason Kessler, who responded by vowing to press ahead with plans for an Aug. 12 event in D.C. Kessler had previously agreed to “actively discourage paramilitary activity” at any future rallies in Charlottesville.